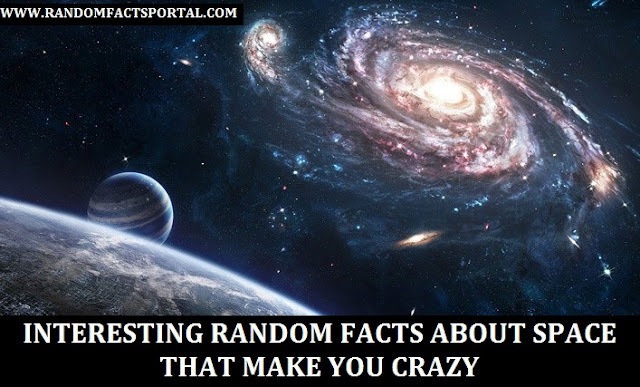 The www.randomfactsportal.com is the good source for the most interesting and random facts about life style, health, celebs, trending news, inspiring stories around the world and more. Always learn something new and interesting about everything. Today we are providing some Interesting Random Facts about space. It will definitely increase your knowledge. If you set in group of friends and you discuss about these Random Facts, you will look so cool and smart. You always have in your mind that, it‘s not surprising that there would by random unexpected facts about everything in world form tinny to large things. Space is mysterious and beautiful; understand it more with this list of one hundred interesting random facts about space, planets, moons and stars! 1. Mercury and Venus are the only two planets in our solar system that do not have any moons. 2. If a star passes too close to a black hole, it can be torn apart. 3. The hottest planet in our solar system is Venus. Most people often think that it would be Mercury, as it’s the closest planet to the sun. This is because Venus has a lot of gasses in its atmosphere, which causes the “Greenhouse Effect”. 4. The solar system is around 4.6 billion years old. Scientist estimates that it will probably last another 5000 million years. 5. Enceladus, one of Saturn’s smaller moons, reflects some 90% of the sunlight, making it more reflective than snow! 6. The highest mountain known to man is the Olympus Mons, which is located on Mars. Its peak is 15 miles (25KM) high, making it nearly 3 times higher than Mt Everest. 7. The Whirlpool Galaxy (M51) was the very first celestial object to be identified as being spiral. 8. A light year is the distance covered by light in a single year, this is equivalent to 5.88 trillion miles (9.5 trillion KM)! 9. The width of the Milky Way is around 100,000 light years. 10. The Sun is over 300,000 times larger than Earth. 11. Footprints and tire tracks left by astronauts on the moon will stay there forever as there is no wind to blow them away. 12. Because of lower gravity, a person who weighs 100kg on earth would only weigh 38kg on the surface of Mars. 13. Scientists believe there are 67 moons that orbit Jupiter, however only 53 of these have been named. 14. The Martian day is 24 hours 39 minutes and 35 seconds. 15. NASA’s Crater Observation and Sensing Satellite (LCROSS) declared that they have found evidence of significant amounts of water on the Earth’s Moon. 16. The Sun makes a full rotation once every 25-35 days. 17. Venus is the only planet that spins backwards relative to the other planets. The force of gravity can sometimes cause comets to tear apart. 18. It is thanks to the Sun and our own moons gravity that we have high and low tides. 20. Pluto is smaller than the Earth’s moon! 21. According to mathematics, white holes are possible, although as of yet, we have found none. 22. Our moon is around 4.5 billion years old. 23. There are more volcanoes on Venus than any other planet within our solar system. 24. Uranus’ blue glow is down to the methane in its atmosphere, which filters out all the red light. 25. The four planets in our solar system that are known as gas giants are Jupiter, Neptune, Saturn and Uranus. Hey! Guys Hope you like “Interesting Random Facts about space”. There were Random Facts in this list that surprised you. There were most of the facts that you didn’t know. In future we are going to share various other random facts and interesting facts along with the treading news and inspiring stories in the world.